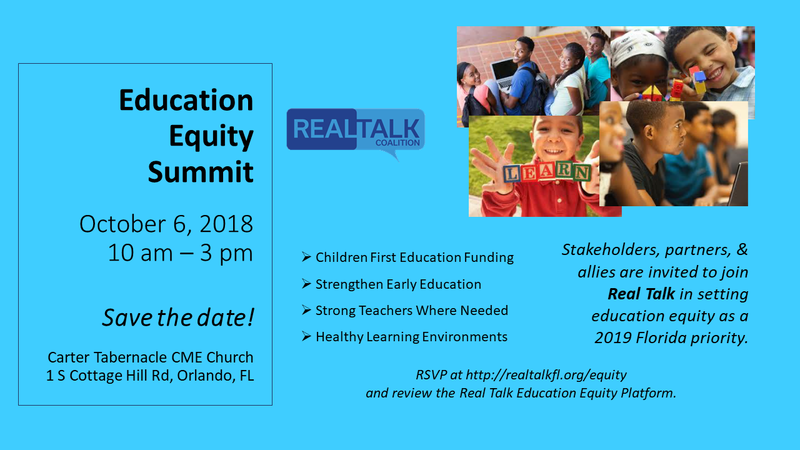 Registration for the Education Equity Summit on Saturday, October 6, 2018, 10-3, Carter Tabernacle CME, 1 S. Cottage Rd, Orlando. We invite you to participate in the first multi-organizational statewide summit on education equity policy platform on Saturday, October 6, 2018 from 10 AM to 3 PM in Orlando. The Real Talk goal is to establish education equity as starting point and center of gravity for public education and its funding in the State of Florida. The summit is the opportunity for the various groups and organizations pursuing high quality public education and coordinate their messaging such that our combined voices coordinate and reinforce the need to transform public education and how we budget for it in the 2019 legislative session. Lunch is provided. Please register below so that we can prepare properly for your attendance. For more information, email: info@realtalkfl.org. The Real Talk Education Equity Platform addresses four main areas in which to put children first. Please select the area that you are most interested in.